Rescuers continue their search for missing miners in a landslide caused by Typhoon Mangkhut at a small-scale mining camp in Itogon, Benguet in the Philippines, September 18, 2018. At least 12 people have been killed and seven injured while dozens are missing due to landslides in the central Philippines, local media reported Thursday. According to Rappler, a Philippine-based online news portal, rescuers continue efforts to reach trapped victims in Naga City, in the Cebu province. Roderick Gonzales, chief inspector for the Naga City Police, said that "more or less" 24 houses were affected by the landslides. It is likely that the Typhoon Mangkhut -- which hit the north of the country on early Saturday and left late Sunday -- was behind the landslide. 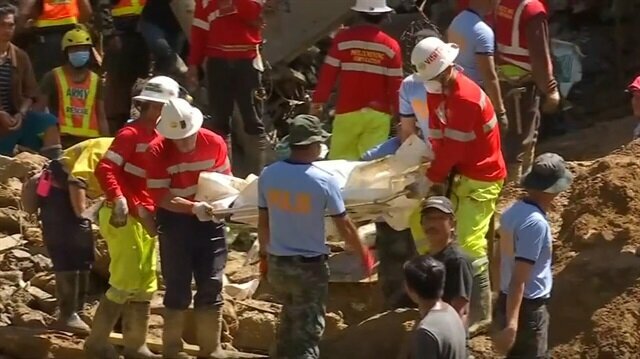 Rescuers retrieved bodies from the rubble of a huge landslide in northern Philippines days after a powerful typhoon struck. Authorities fear the death toll will rise further as more people are thought to be trapped under the soil. 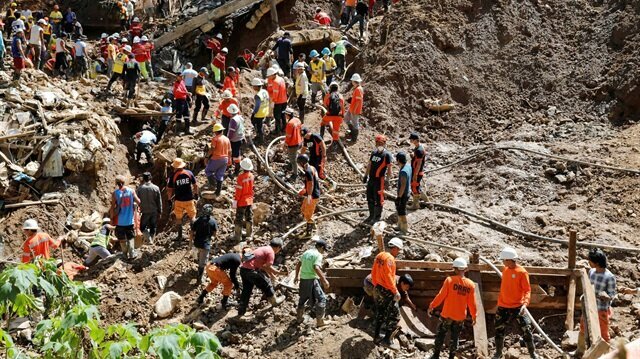 On Thursday the Turkish Foreign Ministry offered condolences to the families of those killed in floods and landslides in the Philippines. “We learned with sorrow of the tragic loss of lives and extensive damage caused by floods and landslides by typhoon Mangkhut in the Philippines,” the ministry said in a statement.